Singapore’s District 5 comprises the Buona Vista, Clementi, Dover, Pasir Panjang and West Coast neighbourhoods. It’s a popular choice for home buyers due to its relative proximity to the Core Central Region (CCR). With a variety of local amenities such as restaurants, bars and shops, parks, gyms and business properties in the area, District 5 is perfect for residents looking for a great location in a lively area with much to offer. District 5 has a good mix of property in terms of affordability, ranging from HDB flats to luxury condominiums to landed property for residences. 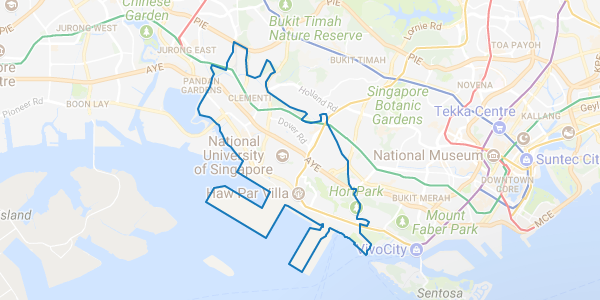 District 5 also has a number of commercial and industrial properties around Clementi MRT, at Star Vista and One North and off Clementi Avenue 6, so local residents are well catered for. For residents looking for great transport links the district is well connected by MRT stations such as Clementi, Dover, Buona Vista, One-North, Kent Ridge, Haw Par Villa and Pasir Panjang stations along the East-West and Circle lines. District 5 is also particularly car-friendly. Residents with cars are well served by the Ayer Rajah Expressway (AYE) and the West Coast Highway. Clementi property owners with cars can also enjoy easy access to the Pan Island Expressway (PIE) via Clementi Avenue 6. For future residents with children or planning a family there are numerous schools in the district, including Nan Hua Primary School, Nan Hua High School and NUS High School. Singapore Polytechnic and the National University of Singapore are also located here for older students and can offer a tenant pool for foreign faculty members and students for rentals in the Clementi and Dover areas. Buona Vista property is well served by the Star Vista mall for shopping and entertainment, and offers access to two MRT lines that will prove popular with professionals working in One North. Clementi property could enjoy strong price growth with the development of the Jurong Lake District and the High Speed Rail Terminus at Jurong East MRT, which is only one station away from Clementi MRT. Residents with homes in District 5 will love the nature and greenery spread across the district with West Coast Park, Kent Ridge Park and Hort Park all within easy reach of the West Coast and Pasir Panjang condominiums.